The 2019 – 2020 NursingCAS Application Cycle will open on August 15, 2019. The last date to submit to the 2018 – 2019 Cycle is September 16, 2019. You will need to submit your application for the current cycle by 11:59 PM EST on September 16 for it to be considered by your program of interest (note you must abide by your selected program’s deadline). If you are applying to programs this cycle then it’s important to ensure your transcripts and references are processed by the close of the cycle. However, NursingCAS will continue to process these supporting documents through October 4 if for some reason your school or reference writer does not submit them by cycle closure. Once the 2019 – 2020 NursingCAS application cycle opens on August 15 you will be able to create a new account or log back into an existing account using the “Re-Applicant” feature. The Re-Applicant Feature allows you to carry over your data and transcripts from your previous NursingCAS application to the 2018 – 2019 application. The “Re-Applicant” feature is available to all users who had an active NursingCAS account during the previous application cycle regardless of whether your application was verified or even submitted to a program during that time. See more details. To simplify the transition to the new cycle, frequently asked questions and answers are outlined below. When does the current NursingCAS Application Cycle close? The current NursingCAS application cycle will close on September 16, 2019 at 11:59 PM Eastern Standard Time. That is the last date you will be able to submit your application. That is also the last date for deadlines on the current application and the last day for applicants in the “Undelivered” status to resubmit their application. We recommend that applicants save and print a PDF copy of their current application for record keeping purposes even though you will be able to carry your data and transcripts over to the next application cycle using the “Re-Applicant” feature. When does transcript processing and verification end for the NursingCAS 2018 – 2019 Application Cycle? Applicants should submit any remaining transcripts and request letters of reference be in by the end of the cycle. However, if for some reason, your school or reference writer does not submit by September 16, NursingCAS will continue to process transcripts and references through October 4. Why is there an overlap period between cycles and which cycle do I apply to? To prevent downtime between application cycles, both the 2018 – 2019 application and the 2019 – 2020 application will be open simultaneously for a short period time from August 15 through September 16. There will be programs that have deadlines which occur (check back for a list) during the overlap period which will remain posted on the 2018 – 2019 application. On the login page of the application you will be able to navigate to either the 2018 – 2019 application or the 2019 – 2020 application so you can apply to programs as needed from both cycles. The majority of programs will be processing applications through the 2019– 2020 application during the overlap period. How do I know if I need to access my program via the old, 2018-2019 application? Check back for a list that will show programs that have deadlines during the overlap. You will need to apply to these programs via the old, 2018-2019 application. What site do I visit if I need to access the old, 2018-2019 application? To login to the 2018 – 2019 application visit https://nursingcas2019.liaisoncas.com. As a reminder this site will only be available temporarily between August 15 – September 16, 2019. On the application login page you can find this link within the yellow text in the sidebar. When does the NursingCAS 2019 – 2020 Application Cycle Open? The NursingCAS 2019 – 2020 Application Cycle will open on August 15, 2019. What site do I visit to access the new, 2019-2020 Application? 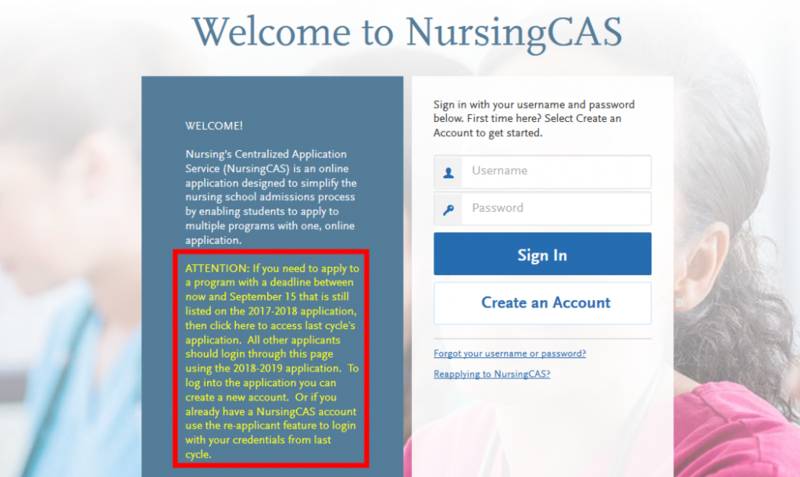 To login to the 2019 – 2020 application visit https://nursingcas.liaisoncas.com/applicant-ux/#/login. Login process and link remains the same. When can I submit my 2019-2020 Application? Starting on Monday, August 19 you will be able to submit and pay for your application. Will there be a “Re-Applicant” feature for NursingCAS 2019 – 2020? Yes. Applicants will be able to carry over their data from the current application (including their academic history and coursework data) to the NursingCAS 2019 – 2020 Application. Your transcripts will also carry over. References from the previous cycle and any data you inputted or uploaded into the “Program Materials” section will not carry over. More information about the Re-Applicant feature can be found here. Will Re-Applicants need to send their transcripts to NursingCAS again? No. If an applicant already had their official transcripts processed during the current application cycle then they do not need to re-send their transcripts. Applicants can send any new transcripts as needed if they have taken additional coursework since they last applied for example. And new coursework data will be verified if the program you are applying to requires verification. Yes, NursingCAS can process e-transcripts from the following providers; Parchment, National Student Clearinghouse, and Credential Solutions. Please check with the registrar to inquire if your school can send e-transcripts through any of those providers to NursingCAS. When can I start my application to programs on the NursingCAS 2019 – 2020 Cycle? On August 15, when the NursingCAS 2019 – 2020 Application Cycle opens, applicants can log into the system and start applying to programs. Any applicant who already has a NursingCAS account can use the “Re-Applicant” feature to carry over their data and transcripts. And any new applicant can create an account. You will not be able to access the 2019 – 2020 Application until August 15. Will the applicant fees change for the NursingCAS 2019 – 2020 Cycle? No. the applicant fee structure will remain the same. The Fee Assistance program will also be available during the 2019 – 2020 Application Cycle. See more details.